Venezuelan President Nicolas Maduro paid tribute to Mao Zedong at the late Chinese leader's mausoleum on Friday before overseeing energy and gold mining deals as he seeks Beijing's help to bolster his crisis-hit country's economy. 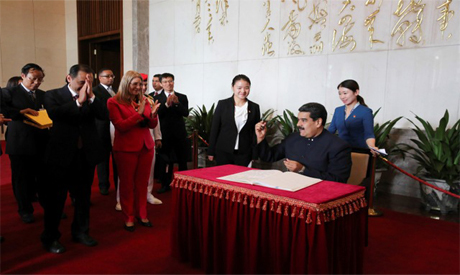 Maduro also praised President Xi Jinping, whom he was due to meet later Friday, for the Chinese leader's vision of a "common destiny for humanity". Maduro is visiting China, his country's main creditor, as his country sinks deeper into an economic crisis. The Venezuelan railed against US and European Union sanctions on his government, saying they had seized billions of dollars and "blocked trade". Maduro may also return home with a new $5 billion loan and a six-month extension to the grace period to service its debt, according to Venezuelan consultancy Ecoanalitica. The foreign ministry said on Thursday that "a stable Venezuelan development is in the interest of all parties". Venezuela's crude oil production fell in August to its lowest level in three decades, excluding a strike in the sector between December 2002 and February 2003, according to OPEC figures.